Posted on January 5, 2014 by Brian under Family, Health. Shortly after the New Year my Grandmother fell in her apartment. When she called me she said she had fell and broke her wrist. I immediately called 911 and had an ambulance sent to her apartment. When I got there the EMS were already on site and I let them into her place. We stabilized her arm and got her to the emergency room. This is where the fun started. Normally my parents are the ones who get called, but my dad works for Boeing and he now works in Oklahoma. So this was my first time doing this and I was unprepared. 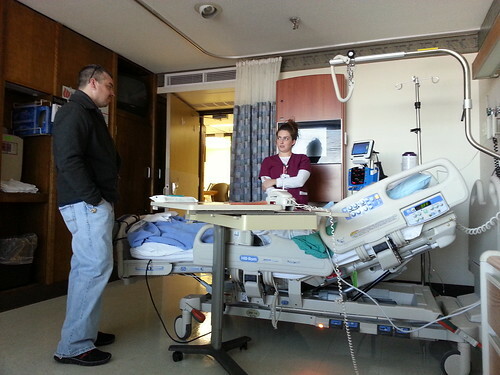 Once we got to the ER they got her in a room and started asking her questions. We went through the normal ones like what how many surgeries have you had, when was the last one and so on. Then they asked her about her medications and after we went through all of those she pointed out that she can’t take a series of pain killers because she has an allergic reaction to them. Then he asked if she drank. She said she likes a glass of wine from time to time. Then he asks if she does any recreational drugs, without missing a beat she said “Yes!” I started to laugh. The nurse looked at her strangely, then she took a moment and processed the question in her head and realized what he really asked. You see, she thought she heard “Do you recreationally drink?” And she answered accordingly. When she processed the actual question she started back paddling to correct herself. Then we all had a good laugh. It’s good when you can take a moment like a broken wrist and hip and still have a good laugh.